This is a money tree created for a 50th surprise birthday party. 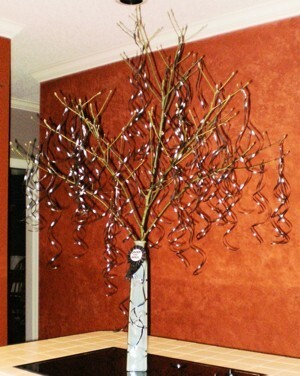 It is constructed of a sassafras branch (dogwood works good as well), curling ribbon in various lengths tied onto the branches. I used a vase as tall as the branch and added sand and rocks for stability. Money, small gag gifts, notes, candy, cards, even jewelry can be added. I plan on affixing 10 $5 bills to start off the decor and have guests add to it. Your idea is beautiful. We have several dogwood trees on our property and I want this for a centerpiece. I think maybe I'll hang crystals from the ribbons though. Thank you for this idea.